Dock windows can be moved inside their current area, moved into new areas and floated (e.g. undocked) by the end-user. 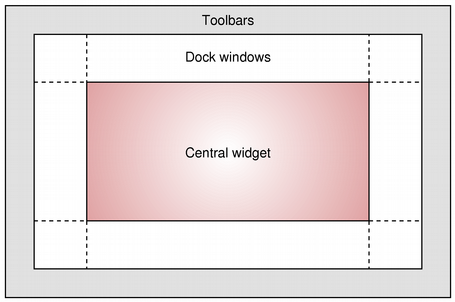 The QDockWidget API allows the programmer to restrict the dock widgets ability to move, float and close, as well as the areas in which they can be placed. A QDockWidget acts as a wrapper for its child widget, set with setWidget(). Custom size hints, minimum and maximum sizes and size policies should be implemented in the child widget. QDockWidget will respect them, adjusting its own constraints to include the frame and title. Size constraints should not be set on the QDockWidget itself, because they change depending on wether it is docked; a docked QDockWidget has no frame and a smaller title bar.